USDA is soliciting applications for Regional Farm to School Coordinators based in San Francisco, Chicago, Denver, Boston, and Robbinsville, NJ. The incumbent will perform a variety of responsibilities surrounding implementation of the USDA Farm to School Program, including overseeing farm to school grants and providing training and technical assistance in a distinct geographic territory. The incumbent will also actively participate in driving the program’s growth and evolution by executing key initiatives and identifying strategic opportunities to leverage USDA investments in farm to school programming. Minimum qualification requirements include one year of experience at a level of difficulty and responsibility equivalent to the GS-11 grade level in the Federal Service. Experience for this position includes knowledge of and familiarity with local and regional food systems policy and practice, including experience participating in the design, execution or management of programs related to local and regional food systems. Specialized experience also includes knowledge of and familiarity with federal child nutrition assistance programs, including experience operating, or overseeing and/or supporting the implementation of school meal programs. The application period closes on Friday, November 1, 2013. To learn more about the positions and to apply, visit https://www.usajobs.gov/GetJob/ViewDetails/353481800. 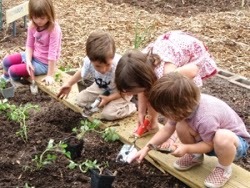 This is really great step taken by USDA to build nature friendly habits in students by growing plants, vegetables and fruits. This will not only increase the interest of kids towards gardening and farming but also help them to take care of our globe by planting trees. Another way to spread awareness among students is to ask them for writing essays on desired topics. Those students who are poor in writing can visit our website here for getting tips and instructions about completing papers in impressive way.